Chocolate Gluten-free cupcakes with gluten free chocolate buttercream. 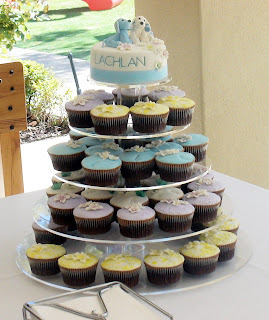 Decorated in all edible fondant decorations to celebrate the Baptism of 2 lucky little boys. 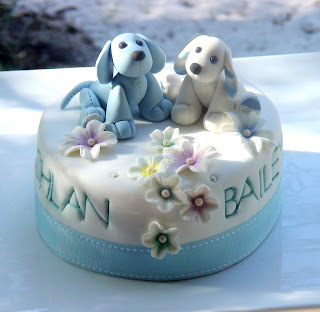 Atop the cutting cake sit two edible Fondant Puppy figurines, but are far too cute to eat and are best kept as keepsakes as they will last a lifetime. May I ask how you get the letters embossed onto the cake? Do you use a scrapbooking stamp of some sort?